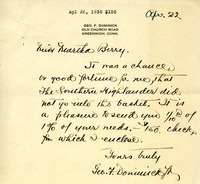 This note indicates the enclosure of a check for $2 for the Berry Schools. 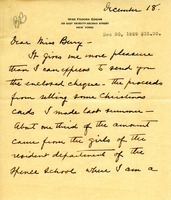 Miss Edgar sends a a check for $35.20 from the proceeds that she made selling Christmas cards. 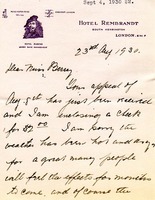 Mrs. Duff sends a large sum of money, in the form of a donation, to Berry. 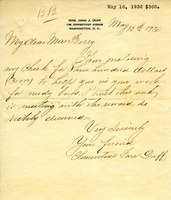 Mrs. DuBois sends a donation to Martha Berry, but only wishes it could be of a larger sum. 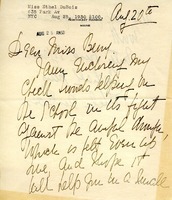 Ethel DuBois talks about sending a check. 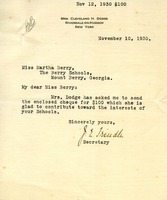 Donation from Mrs. Boone to Berry. 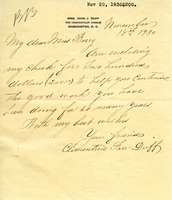 Amelia Boone sends a donation to Berry. 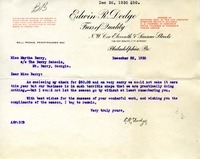 Edwin Dodge sends a check to Martha Berry, and expresses his wish to be able to give more. 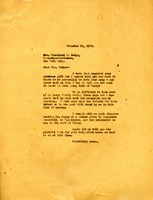 Martha Berry thanks Mrs. 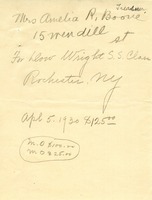 Dodge for her generous gift. 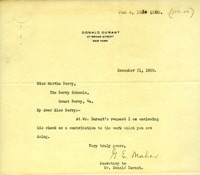 The secretary encloses a check from Mrs. 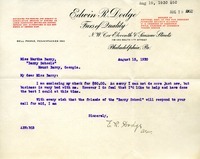 Dodge to Berry. Donation from Mrs. Dickey towards a scholarship. Mrs. Dickey sends a yearly check to go towards the cost of a scholarship.